High above Lyons Great views. Chef's kitchen with granite counter tops, double oven,gas range, island w/sink+bar seating, walk-in pantry, and open to DR + LR! The basement has the family room w/fireplace, and wet bar, media room w/all audio/visual equip. included. The Master suite is well separated from other rooms for privacy. 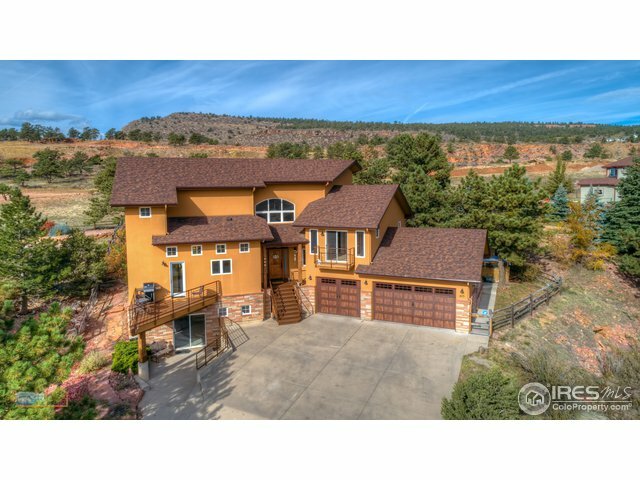 This 4 bedroom, 4 bath home is perfectly placed on .7 acres nestled against the foothills on a quiet cul-de-sac. Oversized 3 car garage allows for storage and work area. Driving Directions: U.S. 36 through Lyons to "T" intersection. Right toward Estes Park, then immediate right onto 5th Ave. North on 5th Ave. to Steamboat Rd, North on Steamboat Rd to Vasquez.